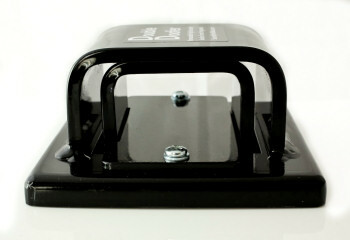 Double Doofer Removable Ground Anchor - The Only Sold Secure-Approved Removable Ground Anchor! New! 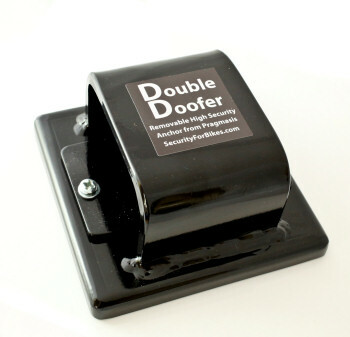 The Double Doofer is a high security removable ground anchor! It is the only one that has Sold Secure Gold approval and the only removable ground anchor with Police approval (under the ACPO Secured-by-Design scheme). If you live in rented accommodation, or if you know you will be moving house, or if you simply know your needs for a ground anchor will be changing, the Double Doofer Removable Anchor may solve your problem! And of course, it is made in Britain! This page gives more information about the Double Doofer ground anchor: how the idea works; chains that are compatible with it; how the anchor is fitted; approvals and more details including how to move it! Double Doofer - How Does it Work? The Double Doofer is basically a two-part ground anchor, and the chain holds the two parts together. It is important that the chain is a close fit as otherwise there could be too much movement of the cover relative to the base, where the fixings are, to prevent a thief gaining access. Hence, the Double Doofer is supplied with Doofer Daptor adaptor plates to adjust the space so the chain provides a good fit, and it is also supplied with detailed instructions on getting the correct fit for a high-security result. It is very secure - unlike some other bolt-in ground anchors the Double Doofer uses four high-quality fixings, rather than relying on poor quality fixings or a single bolt. It comprises two, 8mm thickness, nested steel bridge sections. The cover and outer bridge is thoroughly welded and case hardened to resist freezing, cutting and grinding attacks. It cannot be bolt-cropped. The cover or bridge sections would have to be cut twice in order to defeat it! It can be fitted with DIY tools. Some ground anchors need to be concreted-in. Others require special tools to drill large holes, which you may have to hire. The Double Doofer can be fitted with a normal DIY drill. It is Police Preferred Specification - the only removable ground anchor with genuine Police approval and suitable for credit points under the Code for Sustainable Homes initiative. It is large enough to take high quality large-link security chains that cannot be bolt-cropped. Many ground anchors cannot cope with these chains. Smaller chains can be bolt-cropped in seconds using tools favoured by thieves. There is sufficient space for a single 19mm or 16mm or 13mm Protector (or similar) chain, or two Protector 11mm chains at once (see important note below regarding compatibility with smaller chains). However, it is not compatible with the Protector 22mm Titan chain! The security of the Double Doofer is dependent upon the closeness of the fit of the chain(s) through the anchor. Failing to use the correct chain, or failing to use the chain correctly, can leave your property vulnerable! The Double Doofer relies on a close fit between the chain and the anchor’s ‘D’-shaped bridge pieces to prevent the cover plate being lifted to gain access to the fixings. Zero or more Doofer Daptor plates may be required, depending on the thickness of chain to be used. Restricting movement as much as possible is a good idea. The fitting instructions give detailed guidance. The Double Doofer kit includes two Doofer Daptor 5mm plates. These plates are shaped to mean they can't be removed when a suitable chain is in position (you must first unlock and remove the chain in order to remove the Doofer Daptor plates). It is not possible to fit additional plates - two is the maximum that can be used. Beware that some chains may not be compatible, such at the new Protector 22mm Titan - That chain is too large to fit the Double Doofer, even without any Doofer Daptor plates. Protector 19mm No plates Close fit! Note: A single thickness of Protector 11mm chain is insufficient on its own to adequately fill the gap through the anchor so a single 11mm chain must be looped through twice in order for the Double Doofer to be secure. Please ensure you allow enough chain length to loop it through the anchor twice if you are using a Protector 11mm or similar chain. In common with our market-leading Torc Ground Anchor, the Double Doofer has been designed for easy DIY fit in a wide range of situations using only DIY tools. You should generally be able to fit the Double Doofer in less than an hour. The Double Doofer is supplied with a standard fitting kit that is suitable for concrete floor or brick wall fixing. It uses four expanding bolts/shield anchors. Resin-based and other fixing approaches are not suitable because they can't be removed! 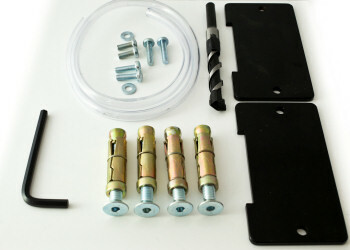 The contents of the fitting kit are shown to the right. The package includes a full fitting kit and fitting instructions, together with all the relevant bolts, a 16mm masonry bit and also a length of plastic pipe to help you clean dust from the holes! The two black plates are the Doofer Daptor adaptor plates that are used to achieve a close fit with a variety of chains. Please note that this anchor is not suitable to use on paving slabs or block paving. Please follow the link for more explanation and advice about fitting a ground anchor to paving slabs or block paving. Reduced Vertical Clearance Below Inner Bridge when Both Doofer Daptor plates are inserted: 34mm approx. There are lots of security devices on the market and it can be confusing to decide which ones are good and which ones aren't. 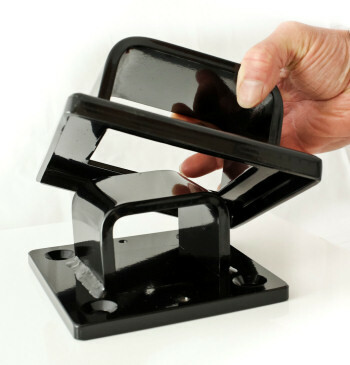 One way of doing this is to ensure that any device you fit is tested by an independent organisation such as Sold Secure or accredited by the Police - the Double Doofer removable ground anchor has both! How do you move a Double Doofer anchor? Easily!!! The Double Doofer Removable Ground Anchor is a high-security anchor but it can genuinely be removed, and optionally installed again in a different location. Once you have undone the four main fixings through the base plate, that can be removed as well and the anchor is then free. If you wish, you can knock the shields (i.e. the expanding part of the expanding bolt fixings) deeper into the drilled holes and then use a cement mortar or grout mix to fill the surface so you have a flat floor/wall again. You might be able to lift the shields from their holes and reuse them but this is not always easy after they have been tightened in position. It can be worth a try as it can avoid you needing a new fitting kit if you want to reinstall the anchor elsewhere! Ordinarily, it is simplest to Contact us for a new fitting kit that will allow you to fit the anchor with fresh set of fixings in a new location. Of course, if you don't need to move the ground anchor, you may be better off using our award-winning Torc Ground Anchor instead! That is offered with a wider choice of fitting kits that can give a stronger fixing in many different situations, and most are cheaper than the Double Doofer!